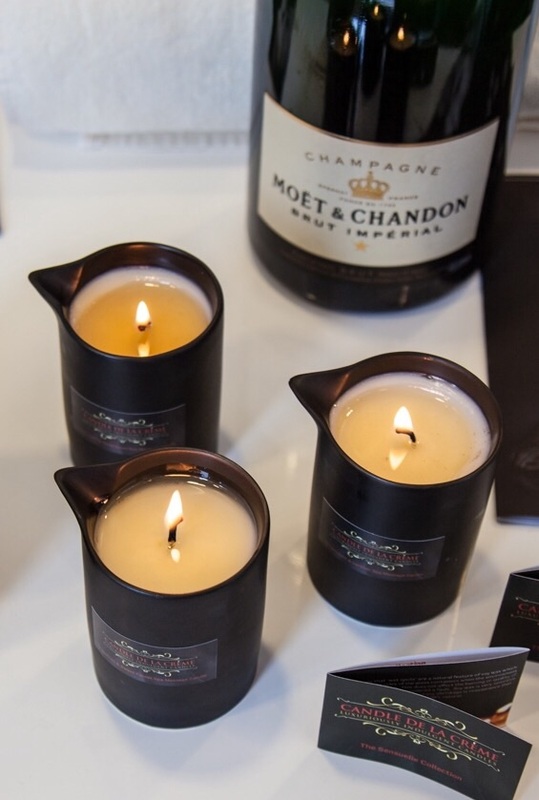 Home | Candle de la Creme by Beverley Pollington! Now Available in miniature size to try! Earn 100 massage moments for a FREE body massage! Discover Candle de la Crème™ the vital missing link between beautiful scents, luxurious spa treatments and glorious skincare. Our spa massage and skincare candles are multi-talented and innovative. Say farewell to uncomfortable cold moisturising! SPA MASSAGE CANDLES – Sensuelle Collection these are 5 in 1 candles that are used as a spa massage oil, a bath oil, a lip balm, a perfume balm and of course as a scented candle using only natural and organic ingredients. Spa massage candles are warmed by a naked flame for intensive nourishment while also distributing exquisite aromas for an incredible ambience. Poured directly onto skin for massaging, enhancing wellbeing and providing time out to relax. Containing cosmetic grade soybean wax, they are naturally enriched with vitamin e, non-greasy and absorb beautifully into the skin. Containing powerful antioxidants and the purest of essential oils that repair, protect and nourish. SKINCARE CANDLES – Cosmétique Collection candles created to target specific areas of the body to beautify or relax. Containing natural ingredients that are renowned to help more specific areas of the skin. The Décolletage Candle™ for example contains ingredients that help to nourish and smooth the more delicate and thinner skin of the neck and cleavage. The Sports Massage Candle relaxes tired and achey muscles while The Pregnancy Candle™ is perfect for expectant mummys! These are just a few of our unique skincare candles for you to treat yourself to! HOME FRAGRANCE – Parfum Maison Collection this is our luxury home fragrance collection containing natural wax candles and decadent room diffusers. A plethora of distinctive fragrances are showcased to entice all tastes and to scent every home, leaving an ever-lasting impression! Free delivery...on all UK orders!! First the scent...then the sensation! Candle de la Crème - Spa and Skincare encapsulated in a Candle!